Pens are brand-new and are intended for single use only. Slender body, easy to grip. Hideaway design, can keep the tip clean when no need to use. Pens have tips at both ends, a Regular Tip, and Ultra fine side for detail work. Both tips are anti-clog and make excellent lines. 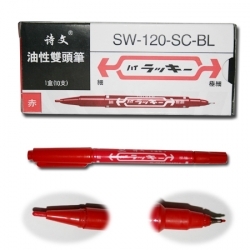 Dual-tip, non-sterile, disposable skin marking pens, used todemarcate sites to be tattooed or pierced. Pens have tips at both ends; a regular tip (slightly finer than a marker), and an ultra-fine tip for detail work.